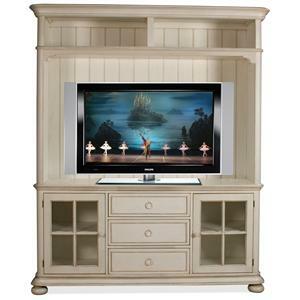 Add a charming touch to your living space with the Placid Cove Entertainment Wall Unit. 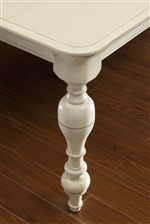 Crafted from Acacia hardwood solids and engineered wood, it features a honeysuckle white finish that is light and enlivening. Plentiful storage space is provided, with multiple drawers, doors, and shelving options. A large center compartment offers space for a large television, and below, two doors concealing shelving and three drawers are perfect for modern media components. Two piers are each side of the center unit provide room for home accents and decor to personalize your living space. 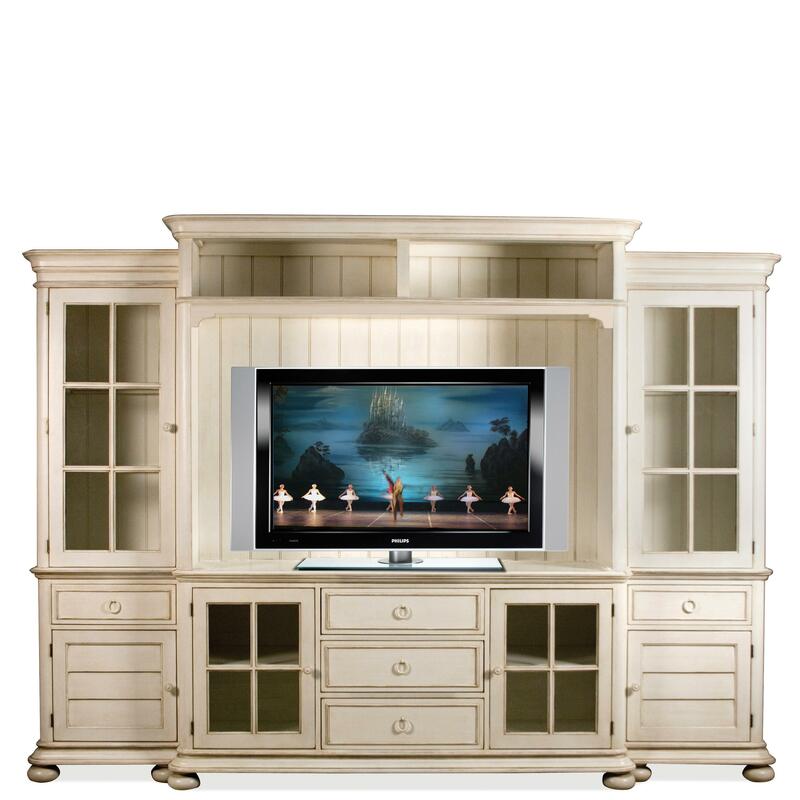 Prettily designed with unparalleled charm, the Placid Cove Entertainment Wall Unit makes any living and entertaining space stylish and cozy. The Placid Cove Entertainment Wall Unit with Panel Glass Doors by Riverside Furniture at Value City Furniture in the New Jersey, NJ, Staten Island, Hoboken area. Product availability may vary. Contact us for the most current availability on this product. Finish You'll appreciate the multiple-step application of Riverside's furniture finishes. 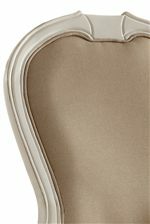 Finishing processes involve several steps of hand sanding, applications of several types of finishing coats, padding and polishing. Storage Six doors, five drawers, and multiple shelves. Case Construction Constructed of Acacia hardwood solid and engineered wood . A combination of cabinetmaker hardwood solids and hand-selected veneers applied over medium density fiberboard (MDF) and particle board. MDF and particle board are used in quality furniture for surfaces that require stability against the varying environmental conditions in modern homes. The use of these materials allows Riverside to design heirloom quality furnishings that are not only beautiful, but will increase in value through the years. 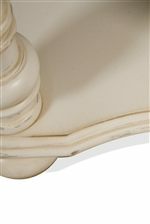 Create a casually refined and subtle, traditionally styled home with Placid Cove. Including occasional, bedroom, dining, and entertaining pieces for your home, Placid Cove has a charming design to enjoy throughout your whole house. Traditionally turned legs and decorative mouldings grace each piece, and plentiful storage options are provided with adjustable shelves, drawers, and shuttered doors. Whether you are looking to dress up a room or add a classy twist to your casual living environment, Placid Cove makes it easy to craft a living space that is comfortable and stylish. 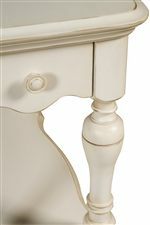 Available in a Honeysuckle White finish, with select pieces available in Seagrass Green. The Placid Cove collection is a great option if you are looking for Traditional furniture in the New Jersey, NJ, Staten Island, Hoboken area. 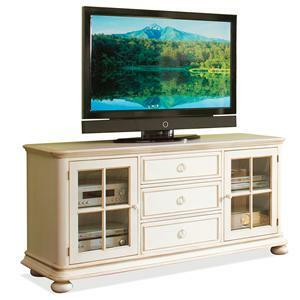 Browse other items in the Placid Cove collection from Value City Furniture in the New Jersey, NJ, Staten Island, Hoboken area.